EcoWater offers a complete line of Commercial Reverse Osmosis (RO) and Drinking Water systems for businesses that rely on high-efficiency and high-purity water. Our standard commercial systems are available in varying output capacity from 350 to 8,000 gallons per day. Larger custom systems are also available. ELP – Series Reverse Osmosis Systems are engineered in response to the need within the light commercial market for a system without a pump. The ELP – Series systems provide a cost–effective solution for customers and are easy to install and maintain. These systems are designed to be wall mounted, and feature a 5 – Micron Sediment and 10 – Micron Carbon Pre–Filters, Slim Line Cartridge Housings, 500 GPD membrane and membrane housing. 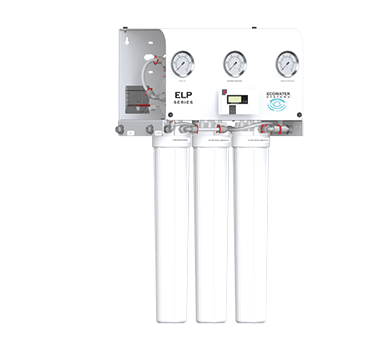 ELP – Series Reverse Osmosis Systems are available in models ranging from 350 to 700 gallons per day (GPD), at a line pressure of 70 psi (ELP – 350 and ELP – 700). The ELP – 500 model is also available with a pump to deliver 500 GPD. ELC – Series Reverse Osmosis Systems are manufactured for light commercial applications and feature a compact space–saving design. The versatile design allows for either wall–mounted or freestanding operation. The ELC – Series Systems come preassembled and ready for immediate online service with minimal set up and simple utility connections. 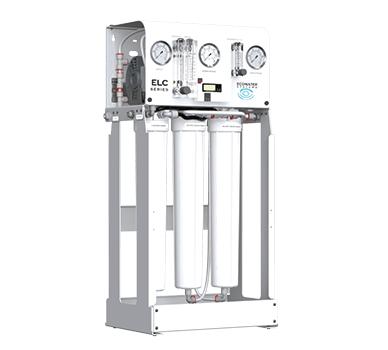 ELC – Series Reverse Osmosis Systems have been engineered for capacities of 750 or 1,500 gallons per day and feature a Low Lead Brass Rotary Vane Pump designed for enhanced performance. 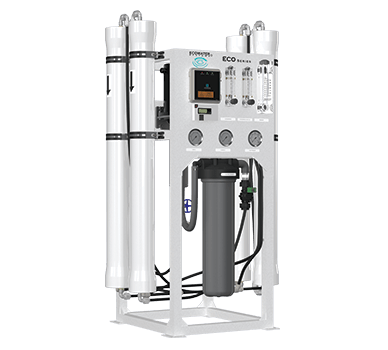 ECO – Series Reverse Osmosis Systems are state–of–the–art, versatile systems for treating tap and well water supplies with flow rates ranging from 2,000 to 8,000 gallons per day with minimal energy consumption and low maintenance and operation costs. ECO – Series Reverse Osmosis Systems feature a robust, innovative design that allows for versatility in the event of feed water quality and temperature variations. Standard features include a composite solenoid valve, low pressure switch, and a stainless steel booster pump for high performance and corrosion resistance.